Availability: The RPSC 2019 admit card for Headmaster Post has been released by the exam conducting authority, and the Admit card will be Released on 30th August 2019. Candidates can check RPSC 2019 Notification for more details. Candidates who submitted RPSC 2019 Application form successfully before can download Admit Card from the RPSC Official website. Step-2: Click on RPSC Admit card link. Candidates will be Redirected to the admit card page. Step-3: Candidates need to enter the token Number/application number, Date of Birth and Exam Name. Step-4: Click on 'Proceed' button. 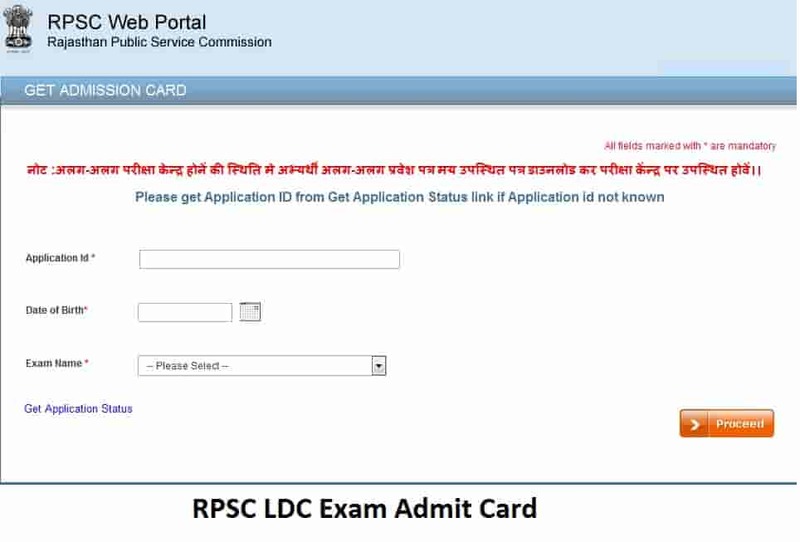 Candidates are advised to go through the details of RPSC LDC Admit card before downloading it. Step-5: Now you can download your RPSC Admit card. As per the RPSC 2019 notification candidates have to carry the Admit card while going for the exam. Candidates are not allowed to enter the RPSC Examination hall without admit card. Candidates should keep Admit card until the completion of the RPSC Selection Process.